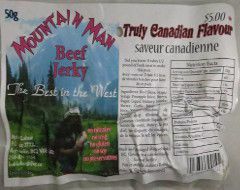 The next review on Mountain Man will focus on a 1.8 ounce/50 gram bag of their Truly Canadian Flavour beef jerky. What makes this flavor truly Canadian is having a great deal of maple syrup. 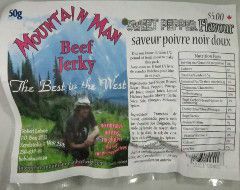 This jerky was kindly submitted for review by Robert Lahue, the owner of Mountain Man beef jerky. 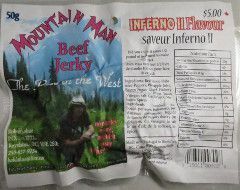 The next review on Mountain Man will focus on at 1.8 ounce/50 gram bag of their Inferno II flavour beef jerky. This jerky was kindly submitted for review by Robert Lahue, the owner of Mountain Man beef jerky. The next review on Mountain Man will focus on a 1.8 ounce/50 gram bag of their rocket fuel flavored beef jerky. 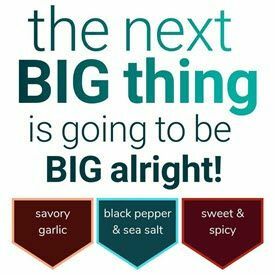 Of the six types of hot flavors that Mountain Man offers, this rocket fuel flavor is the third hottest flavor. This bag was kindly submitted for review by the founder of Mountain Man, Robert Lahue. The next review on Mountain Man will focus on a 1.8 ounce/50 gram bag of their sweet pepper flavored beef jerky. 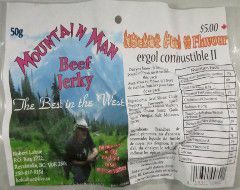 This jerky was kindly submitted for review by Robert Lahue, the owner of Mountain Man beef jerky. 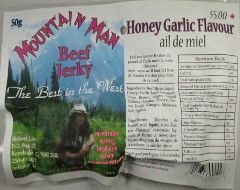 The next review on Mountain Man will focus on a 1.8 ounce/50 gram bag of their honey garlic flavored beef jerky. This jerky was graciously submitted for review by Robert Lahue, the owner of Mountain Man beef jerky.